Alfred King was born July 30, 1930, in Atlanta, Georgia. 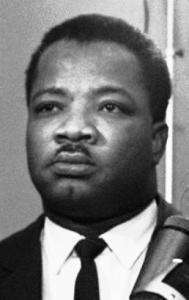 He was a son of Reverend Martin Luther King, Sr., and Alberta Williams King, the youngest of their three children (the other two being Willie Christine, born September 11, 1927, and Martin Luther King, Jr., born January 15, 1929). In contrast to his peacemaking brother, Martin, A. D.—according to his father—was "a little rough at times" and "let his toughness build a reputation throughout our neighborhood". p. 126 Less interested in academics than his siblings, A. D. started a family of his own while still a teenager and attended college later in his life. He was married on June 17, 1950, to Naomi Ruth Barber (born 1932), with whom he had five children: Alveda, Alfred II, Derek, Darlene, and Vernon. A.D. often traveled with Martin Luther King Jr. and was with him in Memphis on April 4, 1968, when his brother was shot dead. A.D. was in the room directly beneath Martin's at the Lorraine Hotel when the gun blast went off. When he saw his brother lying mortally wounded, he had to be restrained by others because of the shocking and overwhelming sight. "Alfred Daniel Williams King". Find a Grave. Retrieved 2016-01-05. 1 2 King, Martin Luther, Sr.; Riley, Clayton (1980). Daddy King An Autobiography. Morrow. ISBN 978-0-688-03699-7. OCLC 6422326. 1 2 Branch, Taylor (September 4, 2010). "Dr. King's Newest Marcher". The New York Times. Retrieved September 9, 2010. ↑ "The Rev. A. D. Williams King". Time. 1969-08-01. Retrieved 2007-11-01. ↑ Naomi King (June 19, 2014). AD and ML King: Two Brothers Who Dared To Dream. AuthorHouse. ISBN 978-1496919168. OCLC 882183463.